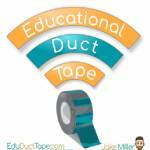 Educational Duct Tape hosted by Jake Miller is the newest podcast to join the Education Podcast Network as of January/February 2019. We're excited to offer a new podcast in the #edtech space joining the House of #EdTech, Google Teacher Tribe, Shukes and Giff, and EdTech Bites. The Educational Duct Tape Podcast focuses on viewing #edtech as a tool used to meet goals, address learning standards and solve problems in the classroom, much as duct tape is used as a tool that solves a plethora of problems in our lives. Each week host Jake Miller speaks with a different inspiring guest with awesome ideas for using tech in the classroom to share and discuss some awesome ideas! Jake Miller is an authorized Google Apps for Education Trainer and is currently the Technology Integration Specialist for Brady Middle School in the Orange City School District. At Brady, Jake helps manage the implementation of Google Apps, 1:1 Chromebooks and Schoology, while working with a team to envision the building’s future integration of STEM, Fab Labs and MakerSpaces. He is a member of the Lead to Learn Project Core Team, which was recently awarded a $750,000 ODE Straight A Grant to further the school’s efforts in 21st Century Learning through innovation, design thinking and project-based learning with access to a FabLab, MakerSpace, and other design resources. If you are a loyal listener of the show we invite you to check out all of our Education Podcast Network podcasts.